Yes, Captain Old Farts & Jackasses has given traditional country fans plenty of reasons to give him a hairy eyeball over the years or curse his name under their breath (anyone remember the tractor rapping of “Boys ‘Round Here”?) But I’ll be damned if Blake Shelton hasn’t been on some prolonged traditional country kick lately, and it can’t be a bad thing with the audience he commands. 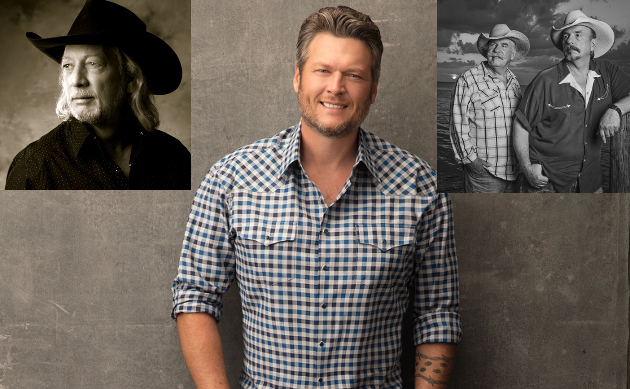 After releasing a run of traditional country covers in late 2018 including “The King Is Gone (And So Are You)” popularized by George Jones, “Tequila Sheila” made famous by Bobby Bare, and “Every Which Way But Loose” sung by Eddie Rabbit, Blake Shelton announced his “Friends and Heroes” tour where he took The Bellamy Brothers and John Anderson, along with Trace Adkins and Lauren Alaina out with him on the road. Blake Shelton doesn’t tour much these days due to his two-season-per-year commitment to NBC’s The Voice. But by all accounts, the 17-date “Friends and Heroes” tour that just wrapped up Saturday evening (3-23) at the Times Union Center in Albany, NY was a big success, and most importantly, country. But possibly more importantly than what Blake Shelton has done or said, is how the “Friends and Heroes” tour has sold. Though it was a short run, and fueled by pent-up buying power since he tours so seldomly, it has also been the most successful tour of Blake Shelton’s career, grossing over $1.03 million in ticket sales each night, beating his previous best in 2018 with $997,000. That means Blake Shelton took a bunch of Old Farts and Jackasses with him out on tour (and Lauren Alaina to represent the ladies of country), and had his most successful run so far, underscoring the commercial resurgence of old school country we’ve been seeing lately. It’s tough to know exactly what the trigonometry behind all of this is for Blake Shelton. Perhaps he’s seeing the erosion in interest in bands such as Florida Georgia Line, and the swell of interest in artists like Luke Combs who are more traditional. Or maybe Shelton’s motivation is not some sinister scheme, and he simply wants to reconnect with his roots. Plenty flush with all that money from The Voice, and not needing radio or awards shows to command a national platform, he can do whatever the hell he wants as opposed to whatever his record label is advising him to do. And when Blake Shelton first started his career, he was pretty damn country. His move towards a more traditional sound was also evidenced on his last record, 2017’s Texoma Shore. Viewers of The Voice will swear to you that Blake Shelton regularly stands up for traditional country music on the show, and of course classic country songs are often covered during your average season. But talk is one thing, and action is another. For some traditional country fans, covering an old Bobby Bare song and taking John Anderson out on tour will never be enough to atone for all the atrocities they believe Blake Shelton has perpetrated during his career. And for sure, he’s done some pretty dumb things during his career. Let’s also not forget that even though Blake is a member of the Grand Ole Opry, he performed all of two times in 2018. But the reason we get up in arms when mainstream country artists abandon their roots is in hopes they will hear our voices saying that we still love the more authentic and true versions of country music, and still want to hear it on the radio, and see it on big stages. Regardless of the motivations and calculus, Blake Shelton listened. And most importantly, it paid off for him, at least when it came to the “Friends and Heroes” tour. My husband and I went to one of these tour stops and it was an awesome concert! You could tell Blake was in awe of John Anderson and the Bellamy Brothers. BLAKE SHELTON SEXIEST MAN ALIVE. If you’re going to Stan for yourself, at least turn the caps lock off. Even though his missteps are extremely cringe inducing, I do like Shelton’s voice and his more traditional country tracks. Texoma Shore was more good than bad, and hopefully the beginning of larger return to his roots. What is this puff piece before the release of his new single? Bizarre. He’s releasing a new single? News to me. Maybe it’s just an article giving him credit for taking a couple of oltimers out on tour with him. Read somewhere that he’s releasing a single written by hardy and devIn dawson. Thanks for sharing this! I did not know about these concerts. He is so obnoxious on the Voice I can rarely watch! Blake is a better singer than most of his peers, but he’s still always felt extremely overrated to me, which speaks volumes about his peers. He’s sort of like Garth Brooks in that his success has far exceeded his talent. Plus, he’s an a$$. The old saying, “The cream rises to the top.”, has never truly applied to Country Music, where good marketing and timing can make dreams come true, with disregard to sheer talent. In a fair world, people like Josh Turner, Daryle Singletary, Mo Pitney, Joe Nichols, Kevin Denney, and the like, would be the megastars, and Blake would be struggling to keep a record deal. I said all that to say that I just don’t care enough about listening to Blake sing, to care what he’s singing or who he’s associating himself with. Blake’s voice is milquetoast at best. I agree 100% King H.
But if he’s ‘seen the light ‘ and his influence brings guys like this to a contemporary ‘country’ listener when he certainly doesn’t have to ( doesn’t need the money or publicity ) ,I’ll give him the credit he deserves for doing so . Better than hearing he took Kane Brown or Walker Hayes of Little Big Town out with him …. Blake has always been on of those artists who frustrate me. Decent voice, great when he chooses to do something country, horrible when he goes full on Bro or AC. But, give him credit. He is exposing his fans to real country music and artists that they otherwise would have never heard of. Good for him. I don’t think he will ever be a true ambassador of real country music, but major props to him for trying. Not a huge Blake fan but his early stuff was good and to give John Anderson and the Bellamy Brothers a big stage and exposure to a younger audience is a good thing. He needs redemption for his old farts and jackasses comments! Blake Shelton may be an overgrown frat bro, but I’ll give him credit. John Anderson, Bobby Bare, and the Bellamy Brothers are great. The more people get reminded of that the better. I went to one stop and it was a great concert from beginning to end. He showcased his heroes in the middle of the show, which was admirable. He didn’t stick them at the beginning or end. It was clear he was in awe of them and that they adored him as well. I liked his Texoma Shore album a lot, which the exception Money. Wish it had more success but applaud him for trying. I don’t he cares anymore about pleasing people and is going to do whatever he wants. Good for him. I went to the show in Green Bay and it was amazing! I had invited my friend who is not a country music big fan but after losing her mom a few months back was just up for a night out so she didn’t really pay attention to the lineup. When John Anderson came up from the floor she literally screamed JOHN ANDERSON is here!!! For me it was a opportunity to see great artists and I hope that it continues. Well,Blake will turn 44 June 18,and sees Country’s latest hot studs shunting him aside.Thus,he likely wants to return to true (and less looks-oriented ) Country before he becomes a parody of his earlier self . Never been a Blake Shelton fan per se but he foes have some good songs in his catalog. My favorite part of seeing a show is usually the “openers” I could take or leave the headliner most of the time. Good on Blake for this decision even if it was a bit of a PR move given the direction country music might be taking. Didn’t his last tour sell out every date as well? I thought I read something about that. Like him or not he seems to do a lot for other country artists on his show and then taking contestants out on the road or setting them up with gigs. He promotes female country singers and actually puts his money where his mouth is by taking them on tour. Same with older artists starting back with the Oak Ridge Boys. Trig you grudgingly pointed out a year ago that Blake isn’t trying to act 20 something. He dresses his age. He doesn’t Song about spring break. He does grease his arms so they glisten before a show (really Luke?). He’s not wearing skinny jeans. I saw him on this tour. It was outstanding. Beginning to end. He did this because, despite what’s said, loves Country Music. Go read the review from the concert in Hartford. That explains it better than I can. A music critic who knew nothing about Country Music left a fan-of all of them. A link for the Hartford review please. Hartford CT? You either like Country Music or you don’t, but you can’t waffle on both sides of the fence. Ok. I just don’t get the whining about the old farts comment from 6 years ago. He wasn’t speaking about artists. He was referring to those who complain about what’s current in country music. And there have been complaints about that every decade it seems. And one sees it on this blog every day. Shelton promotes country music-new and old. I never knew who Ricky Skaggs was until he was on the Voice. He pulls from current artists but prefers older artists who aren’t known on a larger platform on that show. Look Fuzzy every time you post something you reinforce that statement. Man who cares anymore. You happened, that’s what happened. You’re going to die a sad and bitter man if you continue down the path of hating everything other people like. If you can’t find country music out there that appeals to you in this age where we have access to millions of artist at our finger tips, then the problem isn’t them, it’s you. Don’t like what you hear on the radio, you have a phone, a computer a home stereo system. There is no excuse other than just enjoying being that old man who yells at clouds. That’s a bunch of hippie dippie vegan b.s. The problem isn’t me, the problem is people calling a lemon a ham sandwich when it ain’t. Why do you think anybody cares about what kind of music you like? Do you need some kind of validation from strangers like a teenager on tumblr? Nobody lies awake at night worried that country isn’t Fuzzy enough. I say again if you can’t find country music from a living artist that appeals to you in 2019, the problem is you, not them. If we start letting just anybody decide what is and isn’t Country Music, why stop there? We’d end up in short order living in a world in which facts don’t exist and people’s opinions are the governing force. and then how would anybody go about doing anything? If they encroached on the first definition of Country Music, what’s stopping people from encroaching on/appropriating the next definition? and why is the burden on me to find music I like? Why do I have to go through extra work to find music I like when every other style of music is correctly labelled? This is about a whole lot more than what I like, this is about boundaries, reason, preventative exclusion, and gatekeeping. God forbid you put any effort into finding entertainment like normal people. It’s all Me Me Me. You really sound just like one of the younger people/millennials you treat with such disdain in the Maddie and Tae post. for the same reason that Home Depot can’t just start selling office supplies. Because the customers expect a certain type of product. Country fans get served pop country, traditional country on SiriusXM outlaw country, willie’s roadhouse, y2k country, The Highway, Kenny Chesney, Garth Brooks Dwight Yoakam all have their own channels playing different styles of country, Bluegrass channels…. Still unhappy because there’s not a channel called Fuzzy Favorites? Set your entitlement aside for a while a create your very own radio channel on the myriad of streaming services just like millions of other people do each day. But if I want Country Music I have to pay for Sirius? Does that mean I should trade in my 1994 custom conversion van with a tv for a dime a dozen consumer model Equinox? when fans of other genres get what they like on terrestrial radio for free? is the implication here that Country Music is relegated to the underbelly of music? Good news for you fuzzy, just like other genres country music is also free on terrestrial radio. If we believe Statista,Country radio has fallen behind Rap/Hip Hop, Rock, Pop, R&B and Latin music with just 8% of music consumed in 2018. Break country as a genre down even further and what you deem to be not country outsold and out streamed whatever it is you like. Maybe that has something to do with why the type of country you want on radio doesn’t get played much on the radio? But I have more good news, you can sit down by the river in your van and listen to your Spotify user curated playlists for free or just keep hating on everything and everyone. if it’s not Country Music, it isn’t. The problem is real country music is leaving the broadcast culture. As someone said, soon it’ll be only in the realms of professors and historians. fuzzy …gotta say ….you nailed it with your initial comment above . BUT ……labels , radio , award shows AND PARTICULARLY the REAL country acts that didn’t publicly stand up are all to blame ….not just listeners . Curious, are you saying that someone can’t like both country music and rap? That’s music for those other people. Cool, thanks for clarifying, I wasn’t sure where you were going. I appreciate it. Bringing up the old farts joke is getting old. II wouldn’t know who Earl Thomas Conley is if it weren’t for Blake praising him. Damn, I had a chance to see him a couple of months ago here in Pittsburgh but opted not to because the set list of his songs just looked god awful. I didn’t want to sit through a dozen of his radio hits of the past decade just to hear Austin and Ole’ Red, and some micro sets by the other artists. Now I kind of regret that. Cool gesture of him, hopefully he does it again. Austin and Ole Red are some great songs. He was country at one point. as an artist blake has recorded mostly forgettable , pandering , trendy , weak , adult-contemporary kind of ‘ country ‘ . yes …he’s recorded some good ones ……but mostly his ‘hits’ and his albums are un-listenable and safe . saying that , it may well be that HE knows that better than anyone and wishes it was 3 decades ago when he could’ve recorded material he AND real country fans may have related to . today i heard TREE WOODEN CROSSES on the radio and nearly cried …..not just for how good that writing and Randy’s performance was ….but for a time long gone when these songs would see the light of day far more often . I don’t think Blake with all of his $$$$ and access to great music has recorded anything close to Three Wooden Crosses . Why ??? thing is ….with boatloads of $$$$$ now , he should be recording whatever the hell he wants every time out now ….he should be tapping into the best of the best songwriters and it should be as COUNTRY as it can possibly be with NO sign of trendy productions, if he really feels that strongly about keeping those traditions alive . let’s see what his next effort holds . This guy could easily win the ‘Biggest Douche In The Universe Award’…. and I’ll never forgive him for it. Austin sure as hell was country and a great song. He was country star when her highness met him. And now his new queen has helped him go all out Hollywood…..
Shame. But he chose that show above all else. Blake actually is a wonderful artist when he wants to be and has a beautiful country voice when he uses it. What he does do every single time he sings though, is performs! He’s one of the best performers and entertainers of the last decade. He’s always idolized the artists that came before as you call tell when you listen to even his earliest, more serious interviews. He’s a genuine man with a great voice! Trigger surely you can agree that his voice can be amazing in tone and pitch and especially, emotive. What atrocities exactly are you speaking of? Poor Blake….damn if you do….damn if you don’t.